When I bought this car back in 1997, I had a restoration shop rebuild the suspension in order to get the car through Connecticut's State inspection. Part of that work was the installation of a 7/8" front sway bar. Nine years later (Winter '06/07) I rebuilt the front end using all Nylatron components for the suspension and Poly bushings for the sway bar. I also got new end links that, I thought, matched the 10 year old ones I had removed. But between installing the bar wrong and having the wrong end links, this "upgrade" was doomed from the start. 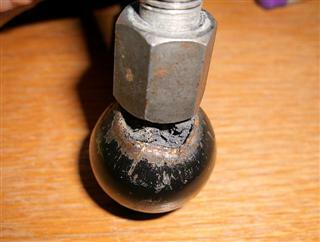 As you can see from the picture below, the threaded end link shaft was way to short once the bushings were in place. No amount of compression gave me enough thread to catch a nut on. No problem.......just shave those poly bushings down a bit until there's some thread to catch. Mistake #1. When I re-installed the bar I still had the car up on jack stands, wheels off and, obviously, no load on the front suspension components. 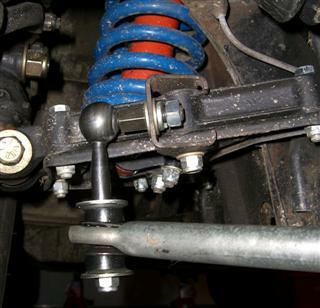 No problem................just use a bottle jack to move the control arm into position and you can install the bar and end links. Only problem is that put stress in all the wrong places. Mistake #2. The correct was is to install the bar and links with the front suspension fully loaded. The easiest way is to drive the front onto ramps and then jack the rear end to get the car in a level and loaded position. Here's what happens when you do it wrong. Looks like it should be OK About 3000 miles later...uh oh! And a bigger Uh Oh....a cracked bracket from the stress. 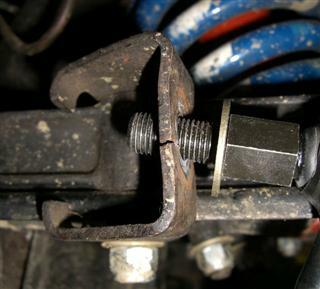 Fellow Mail List Member and Auto-crosser, Bob Lang shared his experience about the need for the sway bar and control arm to be parallel or very close to parallel. He also referred me to the folks at Energy Suspension, who also stated that the control arm and sway bar end should be parallel when installed correctly. 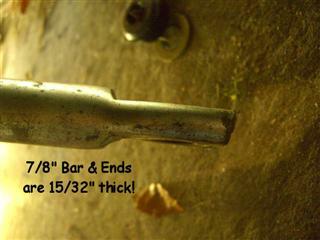 Then an email from Art Lipp at TR Parts.com also emphasized the need to be parallel. Well that will never happen with these end links and brackets. 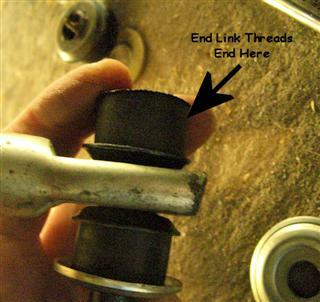 To compound the problem the distance between the end links is 35-1/2" while the holes in the sway bar are 34-1/2" apart so those won't line up without some fitting issues. 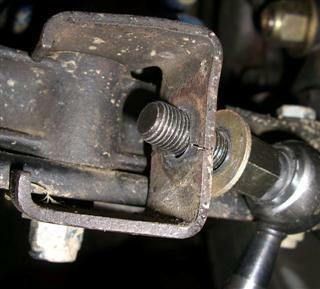 Bob Lang and Art Lipp shared pictures of the mounting bracket they use and it's basically a flat piece of iron mounted to the control arm with a hole on the end for the End Link to attach to. So when you can't find exactly what you want it's time to make what you want. Let's make a bracket!